Leatherback turtles cross entire oceans in search of food. The large amount of gelatinous plankton (jellyfish) in the Benguela ecosystem makes for a potentially rewarding journey for turtles in the South Atlantic. Leatherbacks from at least 3 breeding populations have been found in or tracked to Namibian waters, but just how important is this area for the species? 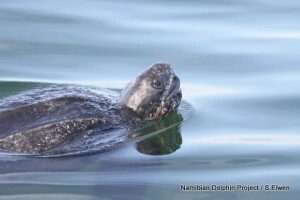 Leatherback turtles have been a regular sight on marine cruises in Walvis Bay since before our project first started. Namibia is gaining recognition as a feeding area for leatherback turtles which are thought to be attracted by the large amount of gelatinous plankton in the Benguela ecosystem (Lynam et al. 2006). These turtles are known to come mainly from Gabonese and Brazilian nesting grounds, based on tag returns from animals found dead in Namibia (R. Braby, pers. comm., NACOMA). In addition, some turtles (two of nine tagged) nesting in the South-West Indian Ocean (northeastern South Africa and southern Mozambique) have been tracked into the offshore waters of the highly productive Benguela current ecosystem on the west coast of South Africa and Namibia (Lambardi et al. 2008). In July 2011, The Second South Atlantic Sea Turtle Network (SASTN) Symposium was held in Swakopmund. The meeting was attended by scientists and conservationists from almost every country bordering the South Atlantic. The goal of holding in Namibia was to promote turtle research here. Following from this meeting the NDP together with NACOMA have applied for a small grant to increase turtle research efforts locally. The money we received from the Marine Turtle Conservation Fund (MTC) managed by the US Fish and Wildlife Service was used to fund a series of summer boat surveys in and around Walvis Bay to collect information on turtle abundance, as well as to fund beach surveys to look for stranded turtles and collect data on size, genetic samples etc., and to fund a trip to the Kunene River Mouth to do the same as well as investigate the green turtle population which is known to live up there.